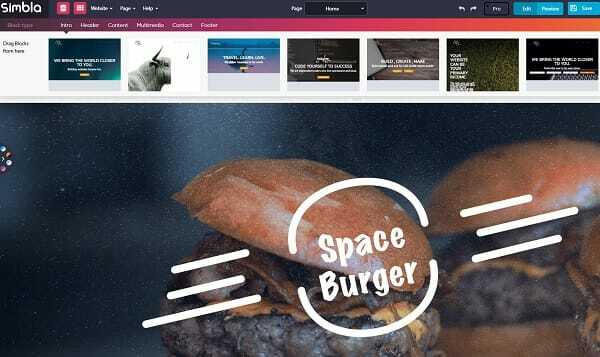 It may sound like The Lion King’s main character or dance style, but Simbla is actually a drag-and-drop website builder that’s so easy to use that you can start publishing within minutes. Founded in 2013, Simbla has distinguished itself as a convenient website builder for simple single-page and promo websites. The major feature of this service is its simplicity (considering the website types mentioned above). But with it’s simpleness this platform has a powerful set of tool for web-developers and designers. Today, we take a look at Simbla website builder, one of the freshest specimen of its kind, to see if it brings anything new to the highly-saturated market of website builders. Simbla requires only a few fields to get started: email, password and location. 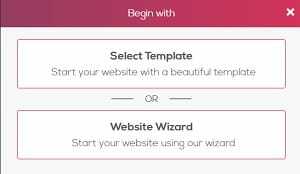 After creating an account, you choose a template and name for your site. You can also entrust the initial stage of your website creation to Wizard. That’s very simple: you just enter the name of the website, choose its type (sinlge- or multipage), set the structure and select the color scheme. Your website framework is now ready and you can proceed filling it with content. Simbla’s interface is clean and easy-to-navigate: from the top bar you can manage pages, configure site settings and add elements. Though the builder is quite intuitive, we highly recommend that you take a quick introductory tour before making any clicks – it will take you less than one minute to complete it. The tour will show you the basics of working in Simbla and help you save lots of time and effort in the future. 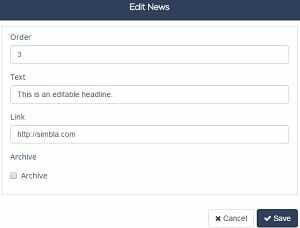 Like most of its competition, Simbla lets you create new pages and populate them with various site elements and widgets simply by dragging those to the page. The list of draggable elements includes headers, sliders, text elements, galleries, flash files, videos, maps, anchor links and also predesigned modules that contain multiple nicely organized site elements. The option that allows adding extra extensions, such as Blog, News and Product Catalogue is singled out into a separate Applications Button. This is quite convenient for the users, who are not actually going to use these extensions. Apart from the extensions mentioned above, the developers of the resource are going to introduce several other tools, namely Knowledge Management, Lead Management, E-commerce и Site Analytics. The Coming Soon sign placed on the tags reveals this intention. Blog. 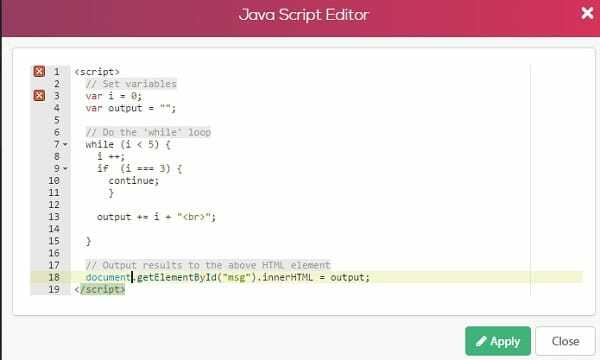 This extension makes it possible to create and edit the posts in the visual editor and in the source code. This is very convenient, when there is the need to add an element, which is not available in the dashboard of a blog. The option of adding tags, SEO titles and descriptions is successfully realized here as well – everything is at hand and there is no need to browse through the additional menus. What’s more, an integrated filter allows users to search the blog posts by author, date and time intervals, which is very convenient if you don’t remember when this or that post was published. News Ticker. This app makes it possible to add a news ticker to the website. That’s very simple – you just need to specify the news link, write it in the title and choose the website area, where the news block will be posted. This allows website visitors to get access to the latest news the author has chosen for them, with a few clicks only. Product Catalog. This application is not an eCommerce feature yet, but it’s quite similar to it. 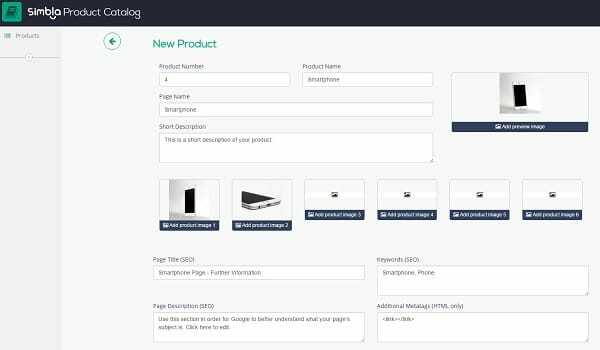 Product Catalog lets you create and edit the descriptions of products available at the website. This can be the catalogue of handmade products manufactured by the website owner, for instance, or something like that. It would be nice to see the further integration of this app with an eCommerce feature, the release of which is announced in a couple of months, by the way. When managing your pages, you’ll notice the Master page option. Master pages house the elements you need to appear on all pages, such as logos, footers and navigation. That’s a clever way to fix a common problem. Well done guys. Simbla has two working modes: Easy and Pro. Both modes provide a total WYSIWYG editing experience, but the Pro mode comes equipped with advanced editing options, such as Grid, Text, Multimedia, Forms and others. It should be mentioned that the option of adding personal Java-scripts to the website is not common for website builders. That’s another bonus for Simbla. Online database builder. This option allows creating and managing client databases for your website or web application. This is a unique functionality for a website builder. Web application builder. Building of your own applications or usage of the readymade web widgets makes it possible to develop websites with the most complicated requirements. It’s worth mentioning, however, that the options mentioned above work better for the professionals rather than for newbies. SEO Features. From the point of view of website optimization, Simbla’s functionality deserves the highest grade. It features an automatic website map generation, an opportunity to add Google Analytics count and other notes to the website header. Apart from that, you can set redirects 301 to the inner website pages even on a free plan. With Simbla, you can begin with a ready template or from scratch. Simbla’s templates have a fresh, modern look, so even if you are a pro designer, you might want to check them out for inspiration purposes. 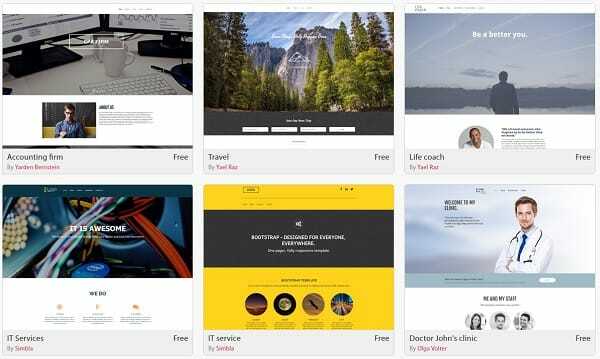 The website builder offers 81 templates, including the blank one. This isn’t impressive, especially if compared to Wix, for example. However, this is more than enough for a newbie, while professional web designers may not need custom website templates at all. There is no subdivision of templates into categories, but the availability of the live preview option make it possible to understand whether this is a single- or a multiple-page template and choose the most suitable solution. Media Queries is another interesting option (for a website builder) that deserves the attention. You can set Tablet/mobile and custom collapse point as well as specify the Menus collapse point value. This is convenient, when it comes to making changes in the responsive layout for unpopular screen sizes. All templates are responsive, and you can preview your site’s mobile and tablet look from the control panel. However, there’s no way to alter the autogenerated mobile look of your site. Simbla has a simple knowledge base that covers all the stages of website creation with this software, and a contact form for those who couldn’t find the answer browsing the support center. You can opt for a free plan and never pay a penny (you can pay with a Facebook Like or retweet). However, you’ll be limited to 300 MB space, and the Simbla URL will tell you. If you want to connect a custom domain and also gain more space, you need to go for a paid plan. There are four paid plans differentiated based on the storage and bandwidth. All Simbla plans come equipped with the same features. Free – 300 MB of storage and bandwidth, Simbla’s domain and 60-day trial for database records, database requests, blog options, user’s customized apps, news and product catalog features. Starter ($6/mo, billed annually) – 1 GB of storage and bandwidth, 1000 database records and 1000 database requests. Basic ($12/mo, billed annually) – 3 GB of storage and bandwidth, an opportunity to connect your own domain, 5000 database records and 10000 database requests. Advanced ($24/mo, billed annually) – 10 GB of storage and bandwidth, 20000 database records and 40000 database requests. Pro ($48/mo, billed annually) – 20 GB of storage and bandwidth, 50000 database records and 100000 database requests. Note that in order to remove the Simbla link (located in the footer of all Simbla sites), you need to go with the Basic or a higher plan. Ad-free Simbla sites start at $12/mo, and that’s a very high price for a newcomer. Weebly’s ad-free Starter plan, for instance, is three times cheaper and has more to offer for that price. Well, Simbla looks very promising. It does offer enough tools to get you online quickly and with minimum effort, yet it lacks of such features as eCommerce and website analytics (but Simbla developers promise to launch them in about two months). All in all, I have mixed feelings about this website builder. On one hand, it has some unique capabilities you won’t see in the average site builder, but on the other, it has a decent amount of room for growth.